Continuing with the success of the 2017 Canada 150 Atlantic to Pacific Celebration, the Canada 150 Atlantic to Pacific Celebration committee is excited to announce the celebration will again take place on Sunday, July 1st, 2018. Spearheaded by Chinese Canadian communities in 12 cities across Canada, the Legacy 150 Celebrations Society took the initiative in organizing the 2nd annual Canada Day Drumming Celebration, which includes a series of simultaneous regional drumming events across Canada, to form a dynamic National Celebratory Drumming Event on Canada Day, July 1st, 2018. 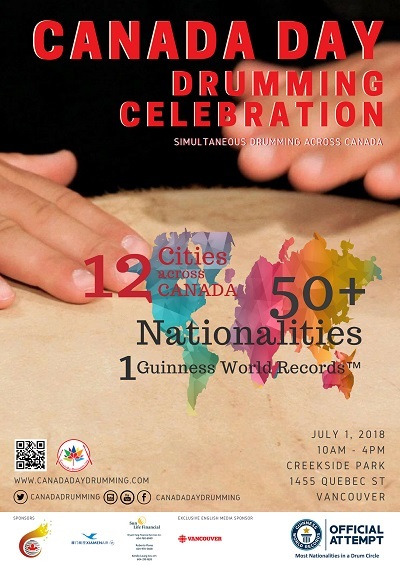 Cities participating in the nationwide simultaneous drumming include Halifax, Montreal, Ottawa, Toronto, Winnipeg, Regina, Calgary, Edmonton and Vancouver, Kamloops, Prince George, Prince Rupert. Our mission is to celebrate Canada Day through simultaneous national drumming to promote diversity, harmony, and peace for a better world. The National Committee hopes to capture the imagination, and engage the participation of thousands of proud Canadians to drum with us to celebrate our unity in diversity. This event has received supporting messages from Prime Minister Justin Trudeau, and Minister of Canadian Heritage Mélanie Joly. Vancouver Mayor Gregor Robertson has officially proclaimed July 1, 2017 and July 1, 2018 (Canada Day) as being An All Canadian Simultaneous Drumming Celebration Day in the city! Please visit the website for more information about the All Canadian World Record Drumming Celebration. Your generous donation will help to achieve our goal of having as many people participate in simultaneous drumming in as many cities as possible across Canada to celebrate Canada's birthday. The Vancouver celebration will also host an official Guinness World Record attempt for “Most Nationalities in a Drum Circle” by gathering participants from 50+ nationalities. People of First Nations, ethnic groups, students and youths a chance to join this meaningful project by forming the core drumming group across and throughout Canada. The general public in as many cities and towns as possible throughout Canada an opportunity to participate in the drumming event. Opportunity to expand the drumming celebrations in key cities outside Canada with large numbers of overseas Canadians. This fund's granting purpose is subject to change. To make a donation, click the "Donate" button below. If you wish to make a donation by cheque, please make your cheque payable to Vancouver Foundation and note “Legacy 150 Celebrations Endowment Fund” on the memo line. To receive a charitable tax receipt for your donation, please provide your contact information along with your cheque.